It was an exciting moment for me when I went back to BFM 89.9 Radio station that early January 2014, mainly for 2 reasons : to see old friends and this time I was the one going to be interviewed by none other but Freda Liu. Not so long ago, I was there, working with the wonderful people there. And thanks to that short stint at BFM, it really opened my eyes to entrepreneurship. It solidified my inner need to do business in Malaysia. After the many interviews I had with business owners, it led me to conclude that I need to dive into the biz world and try it for myself. 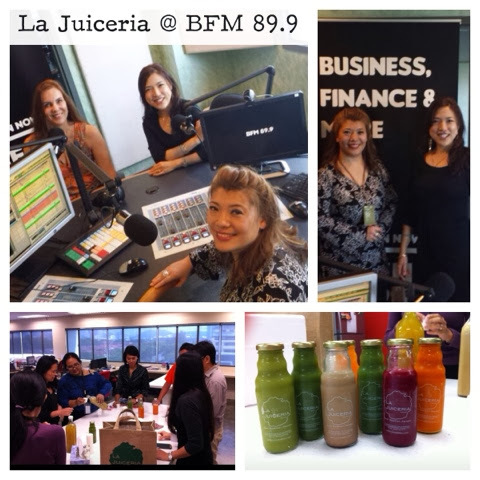 I was so happy to finally share my juices with the rest of the people in BFM. Freda, on the other hand, has been my customer since the beginning. I'm glad she is enjoying the wonderful benefits of juicing. The thing I was most happy about going to BFM? The fact that I was able to spread the word on juicing -- and how it can change people's lives, that is what I am most excited about. I had many people calling me days after the interview. New customers, curious cats and simply people who wanted to learn more. At the point of this blog entry, we are finishing the construction of our central kitchen and office. I look forward to working there, so that I can bring the word of juicing to more people this 2014!